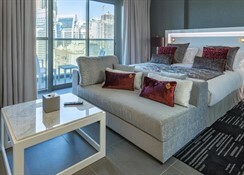 Wyndham Dubai Marina is a luxury family-friendly hotel set on a strategic location with gorgeous views of the Dubai Marina and the Arabian Sea. It offers easy access to major shopping malls, the business district and various tourist attractions due to its proximity to a Dubai Metro station. 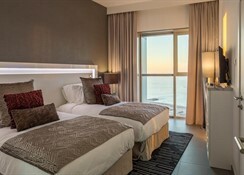 The 493 air-conditioned guestrooms are furnished with plush furniture, fittings and amenities and look forward to offer guests a comfortable stay with warm Middle-eastern hospitality. There are a number of bars and restaurants — the first authentic American smokehouse of the UAE, Blacksmith, Italian dining at Alloro and a beautiful Chillz Pool Bar. With an advantageous location and immaculate levels of services, this is a preferred hotel of travellers to Dubai for business or leisure. 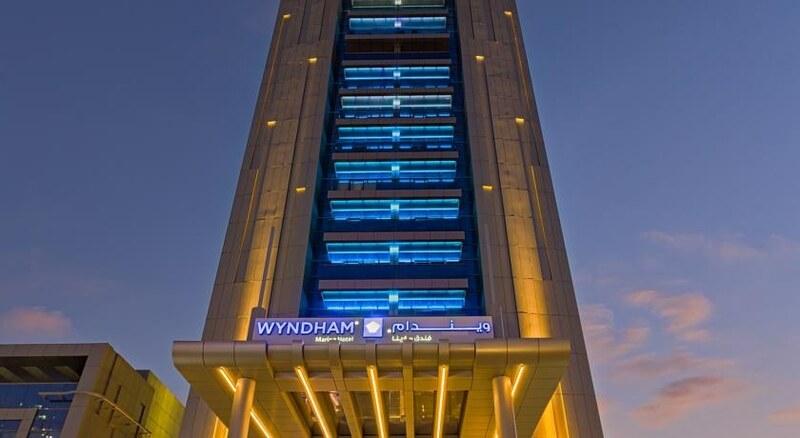 Situated amidst scenic Dubai Marina on one side and the architectural marvels on the other, Wyndham Dubai Marina is within a short walk from the JLT Metro Station. The Walk at JBR, the Open Beach and Marina Mall are all close by. The hotel takes almost half an hour by car from both Al Maktoum International Airport (DWC) and Dubai International Airport (DXB). 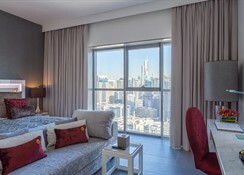 All the 493 air-conditioned guestrooms at Wyndham Dubai Marina are elegantly furnished with en-suite bathrooms with shower, bath & toiletries, seating area, mini bar, flat-screen satellite TV, free Wi-Fi, work desk, safe and tea & coffee maker. 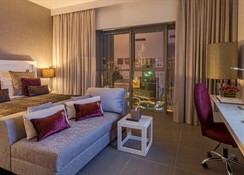 The rooms come in categories such as Superior, Grand, Junior Suite, Club Room, Club Junior Suite and Club Grand room. The Club Room and Suite guests enjoy complimentary access and breakfast at Club Lounge. 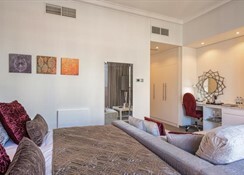 The superior rooms may have a living area. The hotel has two amazing restaurants, one café and a poolside bar. It also boasts of the first authentic American smokehouse in the UAE – Blacksmith; an Italian restaurant – Alloro Ristorante; Hello Café (opening soon) a relaxing café & lounge serving beverages and light bites; a pool side bar – Chillz Pool Bar serving refreshing drinks and finger food. At Wyndham Dubai Marina Hotel, guests can relax and rejuvenate their body, soul and spirit at the luxurious spa. There’s a well-equipped gym with the latest cardiovascular equipment and weight training instruments. There’s also a gorgeous rooftop pool with lovely views of the Marina and the cityscape. The Wild Wadi Waterpark is just 15km from the hotel, where you can enjoy the latest water rides and a relaxing dip in the swimming pool.